Learn how to manage your timesheets' workers. Once you click any of the Add worker buttons, you'll see a pop-out window with various fields to fill out. As you enter an email address, worker privileges will appear. Workers are employees in your company. When you add a worker, you have two options. You can invite a real user into the system so they can clock in/out by adding the employee's email address. They'll be sent an email with the information to set their own password. 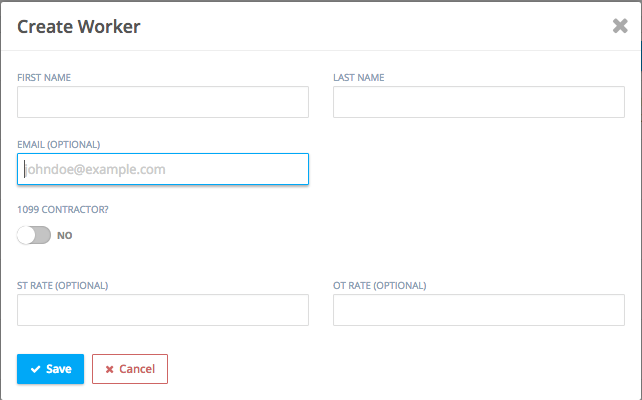 Create a placeholder worker, which does not requires a user to be invited. You can do this by not filling in the Email option above. That worker will not have a log in and is mainly for internal record keeping purposes. If you do invite an employee, we recommend adding your employee’s mobile phone number as well so they can receive a text message to download the mobile app.